Niagara Falls State Park is located in the City of Niagara Falls, New York in Niagara County. The park has the American Falls, the Bridal Veil Falls, and part of the Canadian Falls. Niagara Falls State Park is the oldest state park in the United States. In 1885, the Niagara appropriations bill was signed into law, creating the Niagara Reservation. New York State Assemblyman Thomas Vincent Welch figured prominently in getting the bill signed, and served as the first Superintendent of the Park from its inception until 1903, 18 years. The Niagara Reservation was declared a U.S. National Historic Landmark in 1963. It is a major contributing element to the Niagara Falls National Heritage Area. The park also overlooks the Niagara Gorge and allows access to the Maid of the Mist tour boats, Cave of the Winds, and other attractions of Niagara Falls. The park offers a museum, food concession, a movie theater, a gift shop, fireworks, hiking and nature trails, picnic tables, recreation programs, and fishing. In 2007, Niagara Falls State Park was named as the 10th most beautiful spot in America by The Today Show. Niagara Falls offers visitors a guest pass that allows them entrance into several attractions at a smaller price. Niagara Falls State Park also offers the Top of the Falls Restaurant, located on Goat Island overlooking the Horseshoe Falls. ^ a b "Niagara Reservation". National Historic Landmark summary listing. National Park Service. 2007-09-17. ^ New York State Office of Parks, Recreation & Historic Preservation. "Niagara Falls State Park". Retrieved October 30, 2015. ^ "History and Culture". Niagara Falls National Heritage Area. National Park Service. Retrieved 15 March 2012. 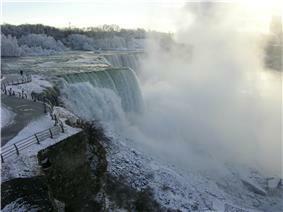 ^ "Niagara Falls State Park Named to Today Show's List of America's Beautiful Spots". readMedia.com. July 12, 2007. Retrieved October 30, 2015. ^ Hufnagel, James (July 17, 2012). "Top of the Falls Dining Experience Falls Short". Niagara Falls Reporter. Retrieved October 30, 2015.